I have been passionate about empowering people my whole life. My journey has been all about empowering people through entrepreneurial pursuits combined with digital technologies and mindsets. As a 25 year Silicon Valley veteran I have been very fortunate to work with some great companies and outstanding people that have taught me so much along the way. As a senior executive at leading public companies including world leaders such as IBM Watson, Apple, 3Com, HP (Interwoven division), Adobe (Omniture), Digitas and others I have been able to work side by side with amazing teams to established global operations across more than 190 countries and personally travel to and work in 156 countries and counting. I love world travel, new adventure and I’m always looking for the next mountain to climb. I am passionate about people and attribute my success to empowering others to be their best. We live at a time in history like no other where we all have access to global communication and tools at our fingertips enabling every individual to advance their companies, their careers and causes that are close to their hearts with focused passion and a click of button. By working in a high tech, SaaS/Cloud, interactive agency environments I have been able to keep my finger on the pulse of how to leverage all of these great empowering tools in everyday life. Please join the conversation here on the blog. As a father of 4 I love family activities, sailing, world travel and making a difference by supporting my Christian faith and important causes in my life. I am a frequent event speaker and a published author with Mcgraw-Hilll Publishing with my book “The e-Marketplace”. Now that it’s clear mobile search volume has indeed surpassed desktop search, multiple recent announcements from Google and Bing underscoring their favoritism of mobile-friendly sites in mobile search results come as no surprise. Big brands and multi-location businesses that might have thought just a year ago they had time to get mobile-ready are struggling now to get it right. Our internal survey data shows that when mobile SEO and user experience are done right, mobile search traffic surpasses the national average. In fact, many of our retailers are seeing 70 percent or more of their traffic coming from mobile, and traffic from mobile search delivering twice as much as desktop. The time to get mobile right is now. THE FUTURE OF MOBILE MARKEING BY WARREN RAISCH – ADOTAS — Even in a down economy, people’s desire to communicate seems to be unquenchable. I am not going to predict this to be the year of mobile marketing, since we have all seen that falsely predicted for a number of recent years now. But I have been very impressed by some key mobile trends that are on the rise. The fact that there are now more mobile devices than televisions and computers combined, speaks of opportunity to me! As marketers plan their engagement marketing strategies for the rest of the year, they should consider these important trends. Text Messaging Surpasses Monthly Mobile Phone Calling: A recent Nielson study found that texting is now more popular than calling someone on your mobile phone. 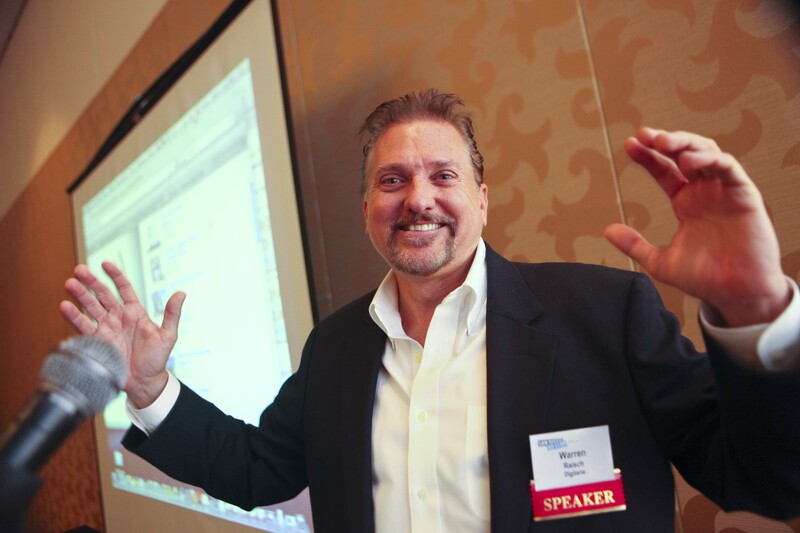 This month I spoke to a group of 400 + marketers at the San Diego Interactive Day event on the topic called Digital Convergence – Are You Ready? it was focused on Emerging Media and the fundamental changes underway in marketing and the overall business landscape primarily driven by recent disruptive developments in technology (Social & Mobile) and more importantly in the cultural psyche shifting trust away from big institutions and government to individuals, groups and communities that they engage and communicate with daily. In a recent Neilson Online Global Survey on Which Channels consumers trust the top ranking came in at 92% of consumers trusted recommendations from people they know. Banner ads only ranked 24% I reviewed the current trends in Interactive marketing. Forrester recently researched the top growth trends in the Interactive Marketing space and is projecting a growth in the interactive marketing space to reach approximately 55 billion per year by 2014 with Social and mobile marketing experiencing the highest growth percentage followed by the more mature eMail, Display and Search Marketing. 2) Mobile Devices are the new marketing Aggregation and Activation Points. 3) To survive and thrive you must start and maintain ongoing CONVERSATIONS with your customers across multiple channels and multiple devices. It is time to Social Activate your marketing! All Marketing is now Social” Social Marketing is not just a program or a department or a function under PR, Corporate Communication or Marketing departments. Social should be incorporated deeply into every aspect of marketing as well as business communications and Customer Care and Service. Mobile is the future of One-to-One Marketing – Mobile is finally coming into it’s own this year. The pervasiveness of mobile represents an unparalleled marketing and business opportunity for the forward thinking companies that engage in Mobile Device marketing early. Today there are more active mobile phones on the planet than TV and Computers combined! In the U.S. approximately 50% of the phones are Smart Phones with Web Browsing and Application capabilities. Over 90% of the mobile phones are SMS enabled. The ultimate dream of all of us in Marketing has been one-t0-one personalized marketing. Never before have we had such reach and access at such a personalized level. Mobile Marketing represents an opportunity to customize a marketing message down to a specific individual by phone or device type, time of day, GPS location, applications running etc. When you think mobile don’t think phone – Think Mobile Device. Within the first 18 months of Apple launching the App Store over 3 billion mobile apps were downloaded. Mobile devices are becoming multi-functional. People use their mobiles today for planning travel, GPS navigation, games, entertainment, movies, telling time, email, browsing the web and did I mention TEXTING! It is staggering to see the growth in texting. According to Nielsen 75 billion text messages are sent each month. With teens being the highest texters averaging 2272 test messages a month. That is almost 77 messages a day. I watch three companies very closely when trying to predict upcoming trends and they are Apple, Google and Amazon. Besides the fact that I worked at Apple for 6 years, I believe that Apple has the best product user interface design in the world. Google has all of the content in the world indexed, searchable and ready for rapid delivery while Amazon has the ability to monetize all of the content in the new world order with one of the most advanced commerce platforms as well as their Amazon Web Services Elastic Cloud offerings that will enable all the applications on the planet to live in the “Cloud”. Eric Shmidt, CEO of Google recently told CNBC that he believes Mobile Advertising revenues will surpass the traditional Google search revenues over the coming years. That is a very bold statement and one not spoken lightly. With the Google acquisition of Ad Mob, the world’s largest Mobile Ad Network, Google is making a clear directional statement. In January it was revealed that Apple bought Quattro Wireless, which laid the groundwork for Apple’s forthcoming iAd mobile advertising platform. Although Apple and Google differ in their ad model methodologies, with Google going the more traditional display banner ad model now imposed on the mobile devices, Apple is taking an entirely different approach. Remember I mentioned earlier that consumers have downloaded over 3 billion iPhone apps so far? You can imagine how hungry those app developers are to monetize those app downloads right? Enter, the iAD. The iAD offers developers a way to monetize their apps with contextual advertising, sponsorships and marketing from within their native app environment. Where a traditional banner ad is seen outside or on the frame of an application of content page and once clicked takes you away to another site, the iAD is an entirely different approach. The iAD delivers content right into the application and allows you to stay engaged in your mobile environment and applications. I think it is brilliant and very engaging and moves us all away from disruptive marketing. My final point, I promise, is that it is more important than ever to think cross-channel and cross-device. For years those of us in digital would try to drive home the point that traditional marketers should include the web into everything that they do. That message finally got across. Now a new mantra is emerging “ Start The Conversation in every channel” So no matter what channel of marketing you are using include hooks to start the conversation either by adding SMS Campaigns to your traditional media that can be activated immediately while you are in front of the media whenever and wherever you are or a hook to Facebook. It is imperative that Social and Mobile engagements are prominently displayed in all of your media. Below is my presentation. I welcome your comments and recommendations. Marketing Convergence Are You Ready? This month I spoke to a group of 400 + marketers at the San Diego Interactive Day event on the topic called Digital Convergence – Are You Ready? it was focused on Emerging Media and the fundamental changes underway in marketing and the overall business landscape primarily driven by recent disruptive developments in technology (Digital & Mobile) and more importantly in the cultural psyche shifting trust away from big institutions and government to individuals, groups and communities that they engage and communicate with daily. In a recent Neilson Online Global Survey on Which Channels consumers trust the top ranking came in at 92% of consumers trusted recommendations from people they know. Banner ads only ranked 24% I reviewed the current trends in Interactive marketing. Forrester recently researched the top growth trends in the Interactive Marketing space and is projecting a growth in the interactive marketing space to reach approximately 55 billion per year by 2014 with Social and mobile marketing experiencing the highest growth percentage followed by the more mature eMail, Display and Search Marketing.